Black Bean and Sausage Stew Bento, a photo by sherimiya ♥ on Flickr. When the weather turns frigid our thoughts turn to... warming soups and stews. How about you? This time it's a black bean and chicken sausage stew packed in TinySprite's Hello Kitty thermal food jar. 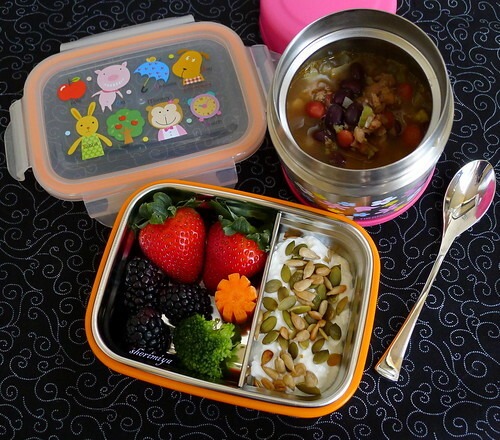 The cute stainless-lined snack pack box contains (on one side) Greek yogurt topped with pumpkin seeds and sunflower seeds, and the usual assortment of berries and nominal veggies. If the main dish is already packed with vegetation, then I can go easy on the side box. Plus, both my kids are drinking homemade green drinks daily, which ensures another big serving of both fruit and vegetables. Win! Yummy! It has gotten colder here and stew sounds just right! Love your blog! That stainless-lined box is adorable - would you mind sharing what brand it is and where it can be purchased?